Review: Set back in time to the 1960’s. This is about a girl named Anna who is a young novitiate nun. She is just about to take her vows when she discovers a dark family secret. The secret goes back to the years of the Nazi occupation. Well worth the watch. So unusual to see a film nowadays in black and white and after a while you don’t even notice. This film deals with issues such as personal, political, spiritual, guilt, betrayal, Christianity, but has also got some warmth and humor in it too. It even has some music (Jazz) in this film which is quite uplifting. I like the length of this film. It wasn’t too long.You have to read subtitles as the film is Polish. The actress isn’t even an actress and was spotted in a cafe by the film’s producer. 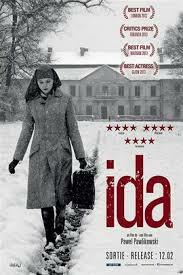 At the Academy Awards this year it won one Oscar and that was for Best Foreign Language Film of the Year. At the Bafta Awards also this year it won Best Film Not in the English Language.